Size: 60x 47 cm. (with full margins). Title: 'Cambriae Typus Auctore Humfre Lhuydo Denbigiense Cam: brobritano'. Italian text on verso. 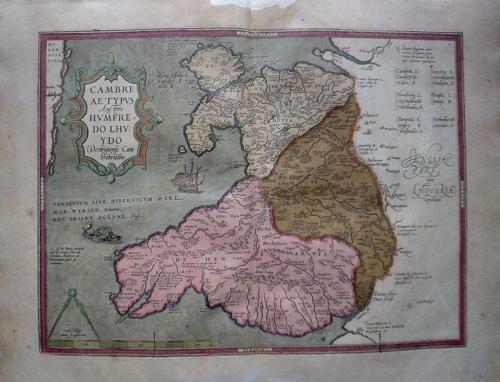 A finely engraved map of Wales from the 'Theatrum Orbis Terrarum' in original colour. The map is in good condition and is on good quality paper. There is a paper restoration in the top margin (visible in the image) although the actual printed area is perfect apart from a pin hole.